Lumumba received an overwhelming 55 percent of the vote, soundly thrashing his opponents – the closest of whom received 21 percent – and flipping the expectations of local observers who predicted a low turnout. The clean triumph clears the path for Lumumba’s transformative agenda to build a city based on the a platform of human rights and political, economic and social empowerment. Lumumba believes people should be granted their right to jobs, education, decent infrastructure and a restorative justice agenda that provides holistic solutions to crime and violence in the community. Before officially becoming mayor, Lumumba will face the “business-minded,” Trump-supporting Republican candidate, Jason Wells, a security guard employee of the Jackson Police Department who many expect will be crushed in the June 6 general election. 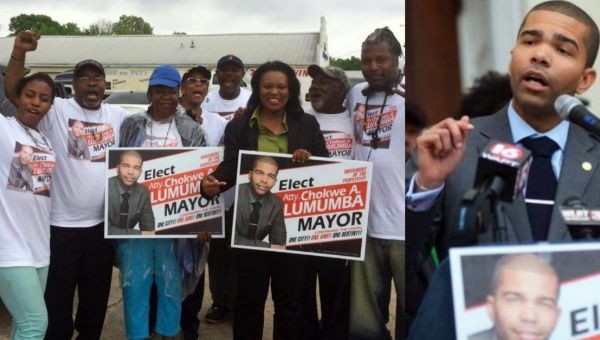 Lumumba is the son of two life-long community organizers: Nubia Lumumba and former Jackson Mayor Chokwe Lumumba, whose untimely death in 2014 came a mere eight months after winning an election in the overwhelmingly Black city. The two late revolutionary nationalists co-founded the New Afrikan People’s Organization in 1984, which later gave birth to the Malcolm X Grassroots Movement in 1990, a mass organization geared toward the self-determination struggle of the African diaspora within the United States. Lumumba’s win sets an example for grassroots forces in the U.S. intent on breaking the neoliberal capitalist and pro-imperialist grip on the country’s social movements and Black political class. Instead, the trend represented by Lumumba hopes to advance a perspective of popular governance stressing solidarity and the self-defense and empowerment of oppressed nationalities and working people in the United States.